There is a fun film called “Plot Device,” which every new writer, and any writer feeling a sense of stagnation or disinterest, should watch. Watch, and then play this game that I thought of as I watched the film. Here’s the short film, “Plot Device.” Watch and enjoy. Now, how do we apply this to writing? Too often, I encounter writers who know where they want their stories to go, but must force the stories along that pre-determined path, insisting on following the story arc even when the characters and developing storyline resist. To these writers, I say, step back and be prepare to be surprised. As in the film, just see where pushing the Plot Device button might take you. You could be pleasantly surprised. Granted, you could be horrified, as the hero is from time to time in the film, but, like him, you still have the option of hitting the button again and taking a different tack. Be willing to try something new, something unexpected, in your writing. Without some surprises, you writing will be humdrum and predictable. In other words, your stories will fail. So, you’re writing a love story, between a young man and a young woman. You want them to meet, encounter some obstacles, and eventually end up together. Great. But the story’s been done. It’s going to take something special to keep your readers interested. Otherwise, yawn. Closing the book. Let’s hit the Plot Device button. Wait a minute, she isn’t young after all! She’s actually several hundred years old, and uses a serum to keep herself youthful and appealing. What will our hero do now? Will he run from her, frightened of what he doesn’t understand, or will he try to understand her, and grow to love her more, finally devoting himself to her in marriage? Or, push the Plot Device button again, and he is actually a serial husband, marrying women in different cities around the nation, or the world. The reader finds out, but does the wife? If she does, how does she react? How will you keep the reader interested in this multi-wedder while also maintaining our interest in and compassion for the wife, or wives? Hit Plot Device again. Just as they are about to be married, the wife falls down a mine shaft (during a picnic) and he dies trying to save her. But she falls in love with one of the rescue workers, so the reader doesn’t feel too bad. Okay, so that’s for a romance novel, where we keep everybody happy. But it’s as easy as that. If your story isn’t flowing as freely as it should, try using your own Plot Device button, shaking things up, rattling your characters, and getting your creative juices flowing. 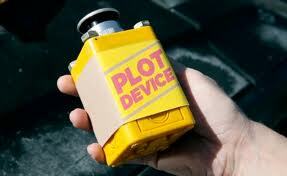 Push the Plot Device button. Uh-oh, hadn’t you killed that spider in the cupboard earlier this morning?….